Following on from yesterday's post showing preparatory work underway at the Kingston Basin at Port Glasgow, this view taken in the Victoria Harbour, Greenock, shows the suction dredger SOSPAN-DAU, which will be undertaking the next stage of the work, and filling in the basin itself. SOSPAN-DAU dates from 1978, when she was built as the hopper ADLERGRUND at Dieppe. In 1992, she was renamed BADEBEC. She was converted into a suction dredger in 2001, and renamed SOSPAN-DAU, which when translated from Welsh means 'Saucepan Two'. Operated by a subsidiary of Westminster Dredging, her name alludes to her owners - Llanelli Sand Dredging - as the town of Llanelli had a tin-plating industry, saucepans being one of the main products. 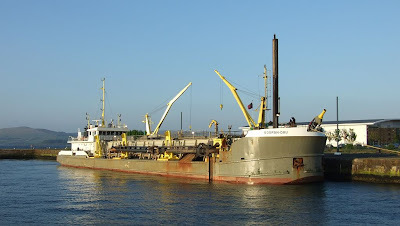 This dredger is unusual in that the spoil she lifts is often pumped ashore for land reclamation, sometimes being discharged via the spray cannon mounted in her bows. SOSPAN-DAU is 71.06 metres long, and can carry up to 1,800 tonnes of spoil in her hopper.